Giant Ground Sloth skull. Fossil replica. Eremotherium Mirabile. Edentate of the late Pleistocene.The original bones found in Florida, segment of AA101. 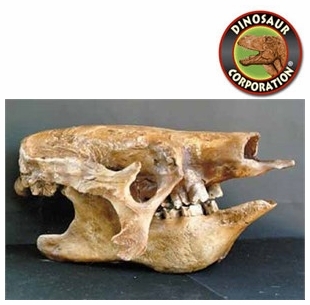 Ground sloths are a diverse group of extinct sloths, in the mammalian superorder Xenarthra. Eremotherium is an extinct genus of ground sloth of the family Megatheriidae, endemic to North America and South America during the Pleistocene epoch. Lived from 4.9 mya�11,000 years ago.